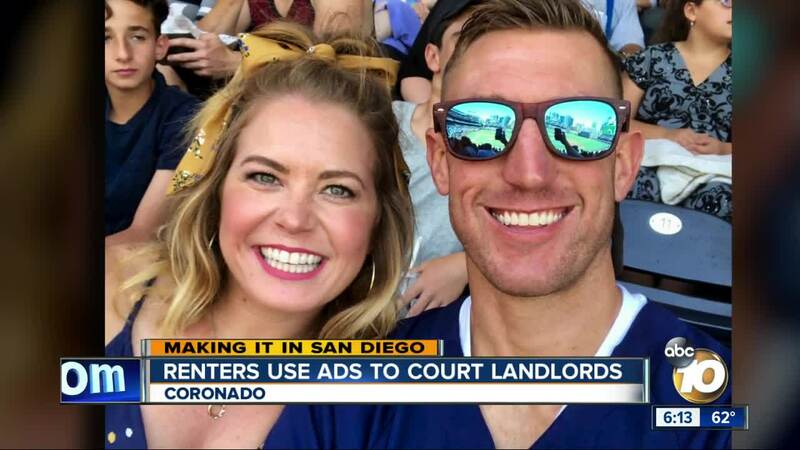 SAN DIEGO (KGTV) - With the lack of housing in San Diego, you need to act fast or you could miss out on a great home. Some San Diegans are getting proactive. They’re not waiting for a home to go up for rent; they’re reaching out to landlords before the property is even available. 10News is sharing a man's creative way to make it San Diego. All it takes is one breathtaking look and the appeal is undeniable. Orange Avenue, The Hotel Del, the Ferry Landing; they all make Coronado irresistible. "Coronado is awesome. It's such a small-town feel. People say ‘hi’ to each other. You know your neighbors," said Cory Stock. Stock is a hard-working Surface Rescue Swimmer Instructor for the Navy. He doesn’t have a lot of time to research and look for a new place to live. "Lots of swimming, lots of PT," said Stock. Work for Stock is either at Naval Base San Diego or at Naval Base Coronado right on the island. So, Stock decided Coronado would also be a great place to call home. But there was one problem. "The turnaround of places is so quick here," said Stock. Knowing anything in his price range might get snatched up in a heartbeat, Stock decided to get proactive and created a post on the Coronado Happenings Facebook page. He was looking for a one or two bedroom rental no later than January 1. It didn't hurt that he threw in the part about being active duty Navy with excellent credit and references, and that he's also a handyman. "The mere fact that you're in the military; it gives you a lot of credit right off the bat," said Stock. In Coronado, being in the military practically means you're already vetted. And it worked. Within weeks Stack and his girlfriend found an affordable home near work, right in the middle of paradise. "Facebook is so big now and social media,” said Stock. “It's a lot easier to get your name out that way to people you'll probably never meet rather than hoping you bump into somebody." Stock moves into his new place at the beginning of the new year.